NCEL Division One champions Knaresborough Town took their points tally for the 2017/18 season into three figures when they overcame Hallam on Monday night. Back-to-back victories from their final two fixtures saw Paul Stansfield’s men become the first team ever to reach the century-mark in the division as they finished what has been a memorable campaign on a high note. 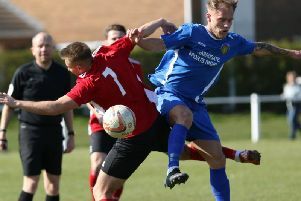 Boro had lost twice on the bounce since wrapping up the championship at FC Bolsover nearly two weeks ago, but got back to winning ways at Dronfield Town on Saturday before coming from behind to sink Hallam. Nick Black lobbed the Manse Lane outfit into a 17th-minute lead at Dronfield when he got on the end of Jack Carr’s pass. Unfortunately, in scoring the goal, Black pulled a hamstring muscle and had to leave the field to be replaced by Colin Heath. The substitute didn’t take long to make an impression, doubling the Boro advantage with 25 minutes on the clock. Dan Thirkell’s free-kick was headed on by Will Lenehan and Gregg Anderson saw a shot saved, but the ball bounced kindly to Heath who gleefully hit home his 100th strike for Town’s first team in a career stretching back to March 2011. Those two goals were enough to earn the visitors all three points and set them up nicely for their trip to Sheffield some 48 hours later. Skipper Lenehan won the coin toss and elected to play uphill on Hallam’s infamous slope during the first 45. As a result, Boro were under pressure for much of the half and had goalkeeper Jack Rushworth to thank on numerous occasions for keeping them in contention. Hallam were however awarded a controversial penalty in the 43rd minute and took the lead as Jake Currie fired home from the spot. Stansfield’s men did however take just 20 seconds to restore parity after the resumption, Carr picking out Ben Parkes whose low effort squirmed in off home custodian David Darwent’s body. Instead of pushing on, the champions were soon pegged back when Anderson was adjudged to have brought down Sam Smith, and Currie again did the business with his second penalty of the evening. In the 63rd minute, Knaresborough were themselves given a spot-kick, again for a minor offence, and Tom Hesketh levelled the scores at 2-2 with his first goal since November. With time almost up, the game looked to be headed for a draw, but the lethal Heath had other ideas. Picking up a loose ball in the Hallam half, he unleashed an unstoppable strike that flew past Darwent, winning the match and bringing up a landmark total for his team in the process.